The Portola Hills community in Lake Forest has seen a huge change on the real estate landscape with the addition of several new home communities. The Oaks and Iron Ridge are in full sales, with The Oaks beginning to sale in late 2017 and the Iron Ridge early 2018. These new additions are selling well. The Oaks would be considered luxury properties with the square footage ranging from 2600 square feet to over 5200. Comprised of seven distinct neighborhoods, all within a private gated community featuring tree-lined streets and premium views, outdoor recreational spaces within our community including a Central Neighborhood Park and Swim Club, a large 5-acre public park with recreation and sports fields and three neighborhood parks. Iron Ridge, the newest community is comprised of six distinct neighborhoods, ranging from Townhomes to large Single Family, ranging in size from 1100 square feet to over 3800 square feet. Each residence offers superb craftsmanship and spacious elegance for today’s active lifestyles. Community amenities such include a Clubhouse, resort style pool and playgrounds. This has brought a completely new dynamic to the Portola Hills real estate market. It certainly has raised home values, but it also adds tremendous pressure on resales. Why, because now resales are competing with Brand New Pretty Homes! 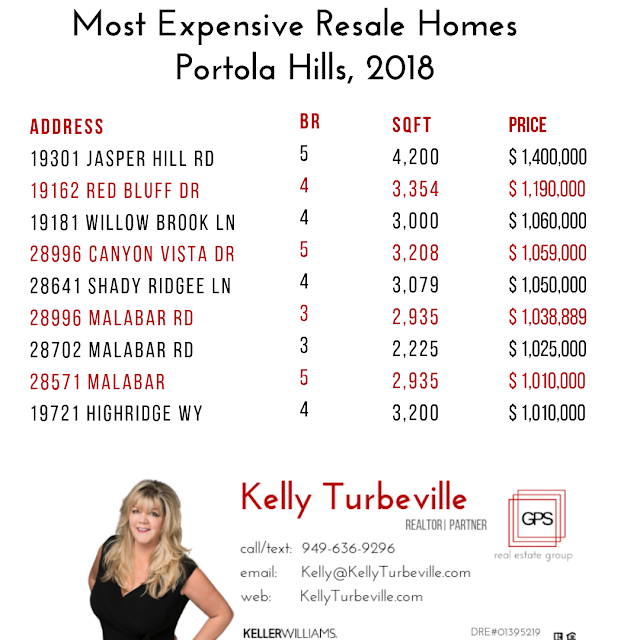 Take a peek at the top selling resales and new homes in Portola Hills. The most expensive home in Portola Hills was sold for over $1,7 million in 2018. That is a huge jump in pricing for the area. Comparably a resale home slightly smaller sold for $1,4 million. As soon as the new builds become resales, the area should see further price gains. 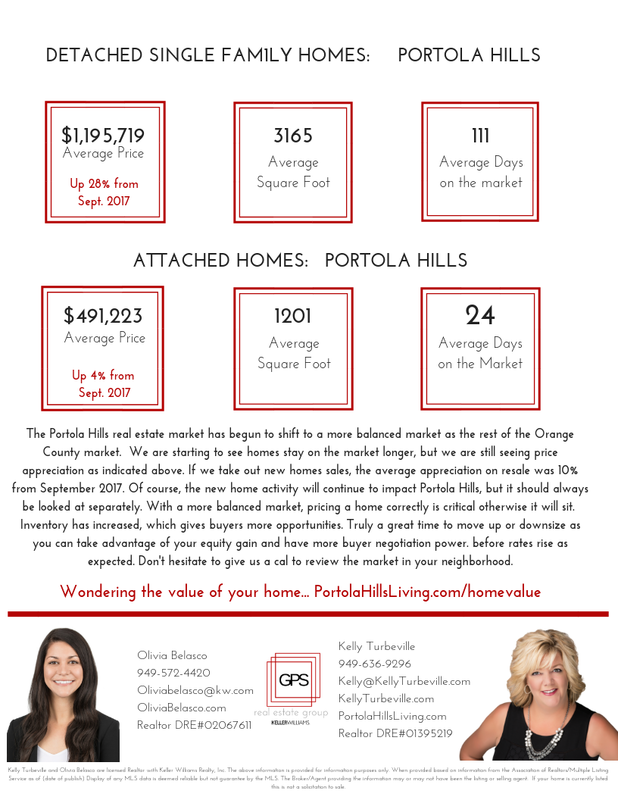 Making Portola Hills an ideal place to purchase a home today. Now we might be a bit bias, as we have always felt this way. The community overall offers a wide range of homes, beautiful landscapes and natural habitat with views of the Saddleback Mountains and the Pacific Ocean. If you are thinking of making a move, don't hesitate to give us a call to review the current market whether buying new or a resale, having a realtor by your side who is passionate about the community is key to get your home sold quickly and for top dollar. We are going to miss you in Portola Hills but we are super excited that you found the perfect home for your family. If we were to pick a neighborhood with similar characteristics of what you loved about Portola Hills, it would be Melinda Heights in Rancho Santa Margarita. The community offers great community amenities for the family. Thank you for entrusting us with the sale and purchase of your home! If you are thinking of a move, now is a perfect time to take advantage of the real estate market, after the slight shift we saw this winter. More inventory of homes is expected to come this summer so listing your home now gives you the advantage of less competition. Don't hesitate to contact Kelly Turbeville today to review the market in your neighborhood. Was there really a 28% increase in Portola Hills Home Values? 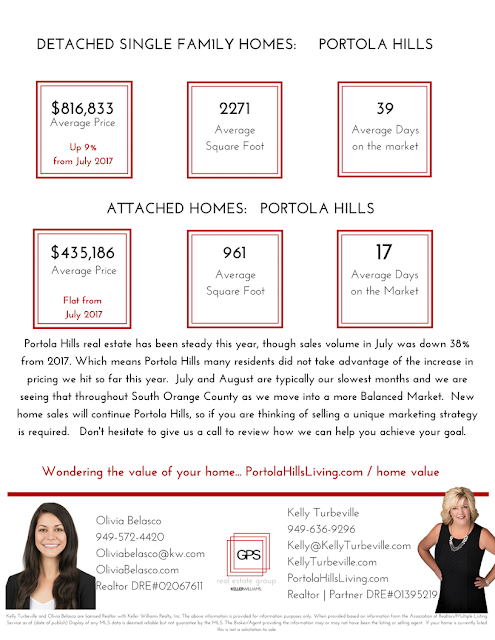 We just finished up our review of the Portola Hills real estate market for September and it was hot, hot, hot!! Both home values and sales volume were higher last month then the same time period in 2017. This is slightly different then the rest of the OC real estate market. Though we are starting to see a slight shift towards a balanced market and homes are taking longer to sell, we did not see a decline in pricing. Looking at the current real estate market, we see plenty of opportunity for both sellers and buyers. Thus why it is called a balanced market. Honestly, if you are thinking of moving up and/or downsizing, today's real estate market offers you the opportunity to take advantage of the equity you gained the last few years and now provides more buying power. Especially before interest rates rise in 2019. I would like to introduce to you Olivia Belasco a new agent on a our team. She will be working with me in the Portola Hills community. When you list with us you now have double the effort to get your home sold or to help you find your next dream home. Actually you have the entire GPS real estate group at Keller Williams behind you. 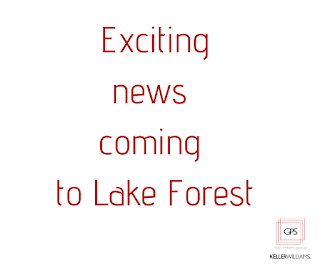 Speaking of Keller Williams, we are some very exciting news to share with Lake Forest Community, so stay tuned!! Don't hesitate to give us a call to answer any of your real estate questions. Our goal is to be your resource for all things real estate! There is a lot happening in Portola Hills in regards to Real Estate. New homes being built, new communities added that all impact your home values. So we took a look at how the market performed in July. Take a peek! Portola Hills saw a 10% increase in pricing from the same time last year on single-family homes. However, on the Condo/Townhomes pricing was flat. Which honestly makes no sense to me, as demand is extremely high. There is certainly room for pricing growth on the attached side of the market. What is the value of your Portola Hills Townhome? The big story in July is Sales Volume, which was down 38% from the same time last year. Why? It could be just a seasonal shift or that we saw an increase in sales before the new homes came into the area. After all it is not fun competing with new homes sales in your backyard. Buyers love to look a pretty new houses, so your house has to compete, otherwise the minute buyers walk in they begin deducting dollars that it will take for them to get your home similar to that new home they just saw. If you are thinking of a move, don't hesitate to give our team a call. We have been successfully been selling homes in Portola Hills since 2004. Speaking of team, I wanted to introduce you to Realtor Olivia Belasco. We are super excited to have her as part of the GPS real estate group. She will be working with Kelly Turbeville in Portola Hills as well support our customer base in Foothill Ranch. If you are thinking about buying your first home, Olivia has a passion working with First-Time Buyers and First-Time Sellers, as well the Single Home Buyer and or Seller. Why, she understands it is a huge step and is committed to walk our clients through every step. Don't hesitate to reach out to her for any questions about the market. Check out our newest listing in Trabuco Canyon!! Why is there a Month for Homeowners? 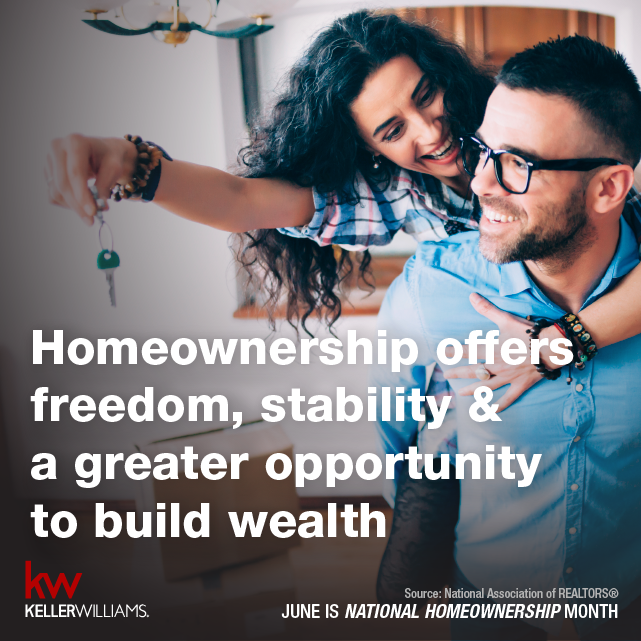 Did you know June is recognized as Homeownership Month. Do you remember that feeling when you bought your first home, or are you dreaming of such. There is no doubt homownership offers an array of benefits both tangible and intangible. It that why it called the American Dream! Below is a quick look at some facts that about the benefits of Homeownership. • 86 percent of current renters want to own a home in the future. • Homeowners bring stability to neighborhoods. Homeowners move far less frequently than non-owners, and hence are embedded into the same neighborhood and community for a longer period. • The average child of homeowners is significantly more likely to achieve a higher level of education and, thereby, a higher level of earnings. • While both homeowners and non-owners may aspire to be engaged parents, homeowners likely live in neighborhoods with more opportunities for school involvement or participation in neighborhood activities. • Homeowners report better physical and psychological health than the average non-owner. • Homeowners are far less likely to become crime victims than non-owners. 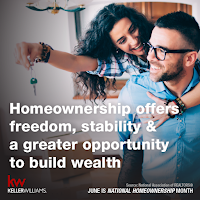 • The median net worth of homeowners increased 15 percent between 2013 and 2016, whereas that of renters or other non-homeowners fell 5 percent. • Homeownership is seen as providing more stability and control over one’s living environment. • Homeowners are thought to be more secure than non-owners since they were not subject to landlords raising the rent or not renewing the lease. • Purchasing a home can improve your credit score through consistent mortgage payments. • Additionally, credit bureaus give more weight to mortgage payment history than to credit cards or other more temporary accounts. Search Available Portola Hills Homes! As a Realtor, nothing brings us more pleasure then to help someone find and purchase their home. To watch them begin their community and the relationships they establish is amazing to watch. If you are thinking of purchasing your first home, or maybe your in the position where you are looking to move up or downsize, please do not hesitate to contact us at GPS Real Estate Group. Our goal is simple it is you. We focus on your goals and priorities and add our winning strategy to ensure you goals are met! 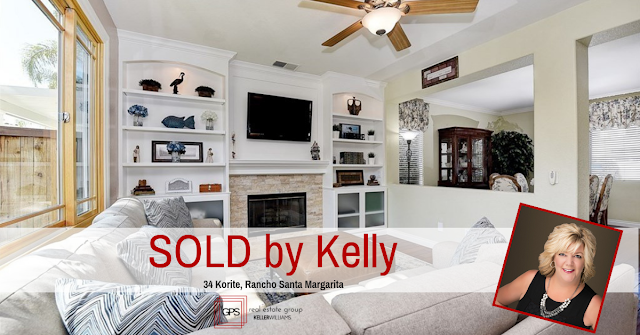 Kelly has been helping first time buyers, single buyers and sellers for the past 15 years in Orange County. She understands taking the step towards homeownership is a BIG DEAL and she likes nothing more then to help you along that path. Even if you are ready now, if homeownership is one of your goals, don't hesitate to give us a call to review your goals. As they say planning makes perfect! There is no fooling how the new communities in Portola Hills are impacting pricing. If you have drove through Portola Hills, you will notice the building of the new communities is in full effect. All positive for the community with the addition of new parks, shopping and trailways. But how does it impact values Below is a summary of what sold the first quarter of this year in Portola Hills. As of this time no, new homes show closed in the last quarter. However, currently there are 24 homes active in Portola Hills and 22 of them are all new builds. This means the inventory is increasing, the area typically has less then 10 homes available this time of year. Below is a look at how the real estate market performed. If you are thinking of a move this year, now truly is the time to list your home. As more inventory comes available this will impact your home. Certainly we should see values increase but that really depends on the mix of homes and often times we see resales take a dip in pricing, until the sale through of the new homes is complete. Why, everyone loves pretty new homes! Buyers will be comparing your home to those lovelies and to a certain degree it must compete. However, in any real estate market, pricing is subject to shift and with the new inventory, increased interest rates on the horizon buyers are wanting to buy now. That means you have a huge opportunity to get your home sold now before both these events take place on this hill. Of course we would love to help you get your home sold. We have buyers calling us daily looking for homes in the area and are currently building our interest list. If you would like to include your home on our list for potential buyers, please do not hesitate to contact us.